I just found a reminder email to myself as I cleaned old emails out to unfreeze my mailing system. It reminded me to tell my eight loyal readers about the cleverest sign I saw when I marched down the Skywalk with Claudia and friends for Duluth’s Woman’s March. The march was a lot of fun and it was gratifying to know it was being replicated all accross the world. When I visited Denver I learned that my cousin marched through Denver the same day while she was visiting her Father, my Uncle Frank. The email concerned the funniest sign being waved in the Duluth march by a friend of mine who keeps advocating for “civility” in the Community and who for long years has despaired over the Duluth School Board. The sign she held was in the Russian language’s cyrilic script. BTW – This was not my first foray into this demographic. 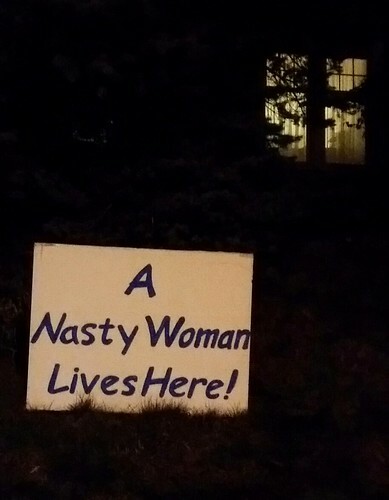 I put this sign up in October but it was stolen from my yard the same night. …for reading my blog. Thank you also for taking part in an important public conversation…….. I have submitted this piece in its entirety to the Tribune and will withhold it until such time as the Tribune prints it. When the Tribune’s education reporter, Jana Hollingsworth, called me I kept her on the phone for forty minutes as I expanded on my thoughts on this sensitive subject. Due to the Duluth News Tribune’s understandable limitations of time, newsprint, and ink, only two sentences of mine were included in the article to explain my still evolving thinking on this episode. In the meantime I must insist on an uncomfortable truth: In the United States free speech does include hate speech however much we may be appalled by it. Fortunately it does not include shouting “fire” in a dark theater nor does it include threats or incitement to riot. My job as a member of the school board is to think my way through what has been happening over the last year and how to deal with its consequences over the next four and possibly, God forbid, eight years. Making martyrs out of Duluth students for parroting the hateful things they hear on the Internet and no doubt in their homes and on the nightly news is not the best or most thoughtful response. That would be fighting fire with grease which would only make the conflagration more intense. Duluth has undergone two recent changes which exacerbate the negativity of 2016 election. 1. It divided its school district into rich/poor and black/white schools at the same time as 2. Its African-American community has begun to expand significantly leading to a white flight from our schools of perhaps 15% of the student population. There has been one heartening development over these recent years. Our children have assumed a generous and open attitude toward their superficial differences. The reaction of students in both East High and Denfeld have been remarkable rebukes to the politics that seem to have generated the “hate speech.” I take great comfort in that. These generous reactions must be supported by the School Board not undermined by meting out “dire punishments” prompted by shock at the outcome of the recent election. We need to follow our better angels. That’s what Martin Luther King Jr. did. His legacy, the “Southern Christian Leadership Conference” has continued for fifty years to keep a watchful eye out for the vestiges of hate and racism that King gave his life to make part of our nation’s past. I do not believe King would have encouraged us to force it underground but would have advised us to keep it in full view where it could be exposed for what it is – a grievous assault on the spirit of justice and equality that our nation was founded upon. My Buddy sent me Andrew Sullivan’s long piece in the New York Magazine which mentioned this fascist libel on General Pershing which I found in a British newspaper’s webpage on You Tube. I grew up with close family friends from the Philippines. I had a Muslim roommate in High School. Having seen this video I can state unequivocally that anyone who sees this and votes for Donald Trump for President of the United States is a traitor to everything the nation’s founders hoped for the United States. If that means you………YOUR FIRED! Emigrate to Russia where you can have a leader who joins you in your admiration of this pig blood drenched huckster. 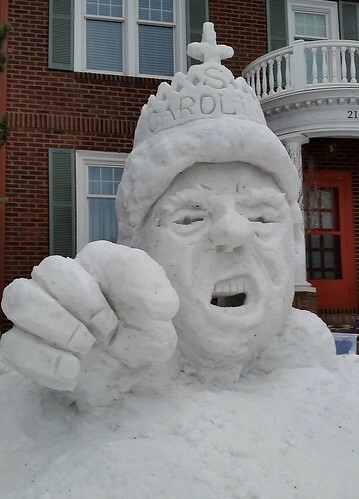 I had a few choice thoughts on Trump in a temporary blog I set up in January when this one went Kaflooey including my snow sculpture tribute to Ms. South Carolina. Tonight I decided to look through old scribblings of mine thinking that I might be able to cobble a book together for use in a possibly nefarious activity in the near future. I discovered a 2002 column I had written for the Duluth Reader during my four-year stint as a columnist. The column presaged the email I’ve been receiving for the past couple weeks from students and parents trying to save the zero hour. In 2001 I labored long and hard to pass an operational levy. It was an uphill fight. I remember PTA President Judy Seliga-Punyko telling me that she wouldn’t vote for it. She was mad that the school board hadn’t acted on my idea to slim down from three high schools to two high schools. I thought her reasoning was nuts. The following year after the failure of the levy we put an end to the seven period day. Years later Judy’s memory of the loss of the seven periods involved my being on the School Board when it happened so that I could take the blame. She had no memory of voting against the referendum that would have allowed us to keep it. Well, I’ve pasted the last half of the column below which deals with the Union’s crocodile tears about having lost the extra period. The column begins with my mulling over another run for the legislature in the 2002 election. I eventually did run and lost – one of my thirteen electoral defeats. I think its 13. Its hard to remember them all. Last week I bumped into my old nemesis Frank Wanner, the teachers’ union president, a fellow who helped put me in the minority. While my feud with Frank was put to bed two years ago my feud with the folks he helped elect lives on. Well, it’s true that one of them was defeated last year, but the three-high school supporters still have more votes. Frank was very cordial and suggested that we get together. I promised to call. The next day I had to leave a message with him because he was holding a press conference about saving the seven-period day. I sure wish he’d done this before we finished registering students for a six-period day! When my wife saw him on the news she said, “No wonder Frank was so friendly!” The next day I left another message for Frank. The weekend was blissfully free of politics (except for some email) until we joined friends for an Easter Dinner. Our friend’s son is interested in political science. He told me that Frank likes to bad mouth SUVs in class. Apparently my website gets discussed too. That explains some of my email. Frank called me back on Monday and we agreed to meet at Bixby’s. I told Frank that I’d heard that he hated SUV’s. He smiled and asked where I’d heard this. I told him that I had my sources. We talked about his seven-period day proposal which he assured me was not a negotiations ploy. I prefer to take him at his word. The DFT wants high school students to be able to take up to seven classes a day. Many students, teachers and parents are convinced that this is a key to getting into their preferred colleges. Whether it is or not the six-period day is our response to financial hard times. I told Frank what I keep telling the Board – if we had two high schools we could keep seven periods. Frank didn’t disagree. Ah! But I’m in the minority! If I could just get elected to the legislature maybe I could do something about school finance. I’m sure not having much luck on the school board. A. I just read a worrisome story on my cell phone from Politico about Google’s potential to determine the winners of elections. Reassuringly I found it easily just now on Google itself. It was the first thing that came up in my search results. B. I’ve been skeptical but neutral on the current enthusiasm for Ranked Choice voting. I can’t argue that our current politics isn’t a bit broken. I hate the current ability for the super rich to funnel their money secretly into political campaigns but event that is nothing compared to what Google could do if it were so inclined. I view Ranked Choice proposals in much the same way as campaigns for civility. It could end up being a wolf dressed up in a sheep’s clothing. C. There was a Zenith story on ranked choice voting which made a claim I’ve not heard before about the proponents of the system. The Zenith described one such group as being a Scientology-like organization which excelled at harassing critics of Ranked Choice Voting into silence. I’m a skeptic of both panaceas and harassment. D. There is one local issue of small importance except to Duluth’s Lakeside neighborhood. At the moment owing to some antique decision from eighty or ninety years ago there are no liquor sales permitted in that neighborhood. It strikes me that the City Council is attempting to justify a change to allow liquor sales but doing so in a spineless manipulative way. Its offering a non biding vote on the subject for all of Duluth to weigh in on and not just the Lakesiders. Should it pass I can imagine the Councilors proclaiming that this city-wide vote is good enough for them no matter what the Lakesiders think. Chocolate is good for the brain and memory. I don’t know how much that is hype but I welcomed hearing that on last night’s news. Maybe my consumption of the stuff will counteract the short night sleeps I often get when I’m trying to solve the world’s problems. Its just after 2 AM and after close to four hour’s sleep (not bad for me) I woke up agonizing about how the Republican Party has reinvigorated some long discredited notions about economics. Its made for good electioneering but that’s only if you take short term election success as your measure. This could be the last election cycle it works for the GOP in this mid term election before the old white majority of voters begins to peter out. I won’t go into any depth…..in fact I’m out of my depth on this but I’ll put down some bullet points before retreating to proofing and editing the three recent “tenterhooks” posts that by now are already old news. Government spending and borrowing have been doe see doeing forever. Time and again great nations have been brought to their knees by taxing themselves to death for great egos and warfare. Israel’s King Herod, Robin Hood’s King John and a great many other’s lost favor by being accused of overtaxing the nation to build Temple and other public amenities or financing great wars like the Crusades, in John’s case for his vainglorious brother Richard the Lion Hearted. And yet such public spending can take an economy and help it break from the doldrums. The North’s Civil War spending, despite the debt, pushed its economy into the stratosphere that kept up despite a couple of recessions until the Depression. FDR’s modest domestic spending during that time edged the nation away from recession but it was finally conquered by the massive military spending unleashed by Pearl Harbor. Hitler had taken Germany out of its Depression even earlier by building up his military and even avoided blame for too much taxation by simply stealing the wealth of the Jews to help finance his world take over. The argument between guns and butter continues to this day. Not making a choice between them is what tarnished LBJ’s Presidency. He wanted both when the GOP only wanted the war spending because it suited their appeal to patriotism. Actually this is not quite true. In my youth the GOP had pretty much conceded the point that John Maynard Keynes was right about government spending’s power to get an economy moving. They had been saddled with Herbert Hoover’s fabled inaction for forty years by the time I became politically active. They were all Keynsians according to an economic mantra of the sixties and seventies. But they would soon abandon Keynes when they resorted to their “Southern Strategy” to win elections. The South had benefited greatly by FDR’s spending but had been very stingy doing its level best to make sure black southerners got nothing. The traitor LBJ began throwing money at poor blacks in the South’s estimation and this after enforcing their Constitutional right to vote in 1964 by trampling all over the South’s much cherished Jim Crow State’s Rights. Suddenly all the Republican Keynesians were on the run and replaced by small government Southerns who only wanted to spend money on Defense, being the great patriots they were. George Herbert Walker Bush from that old discredited pre-southern GOP jabbed at the ascendant Southern appealing Ronald Reagan by calling his Defense spending plans “Voodoo Economics.” He shut up about that to become Vice President and then watched as Reagan borrowed like crazy to pay for Star Wars which did indeed help bring the Soviet Union to its knees at the cost of a massive Federal Debt. It was the debt that the old GOP found disagreeable but not the new GOP. It discovered that it could go into debt and then let Democrats take over and beat them up for the Debt by reducing federal Domestic spending for things like the War on Poverty. The old Democratic accusation that Republicans were all about “trickle down” economics lost all its sting in the age of a thousand billionaires and the biggest prison population in world history. So this is what woke me early this morning. Its why I didn’t vote in the primary election for the first time in my life and while I will barely give a damn when I vote in the general election next week. Our politics today is mentally stunted. We need more minorities to wrest the economy from the old white folks who were given so many economic protections during LBJ’s Great Society that today they live well and long while one-in-five American children go to bed in need. Now on to that unpleasant editing I promised myself I’d get to. I must admit I am right where the majority of Americans seem to be regarding our elected government. I’m bummed out. I’ll also confess that in the recent primary election I was guilty of a first. I didn’t vote. I always vote but didn’t this time. I’ll vote in the general election but with little enthusiasm. Today’s newspaper had its fill of last minute stories about the looming November election including letters to the editor. There was only one that caught my interest. It was from a woman thanking the Trib for its recent story about the massive inequity in Duluth’s angry Red Planet. The writer wants the School Board to be reshuffled. I have little doubt that she will get her wish but it won’t be until next year that the Duluth School Board seats will be up for grabs. It will only be three of the seven as the other four were up for the ballot last year. I hope voters interpret this into voting every member out at the first opportunity. The taxpayers can all shout, “We told you so!” even though that doesn’t get us out of the mess we are in. I think a change of Congress would be far more likely to improve the climate in America today than a change on the School Board will clean up the Red Plan mess. We have close to twenty years of debt we most likely can’t be excused from paying off and that is a longer stretch of time than I have the heart to serve on this board. Still, a new board might pick up a mop and pail and get started. The current one has locked all the broom closets. I got a call just now 45 minutes into today’s election. Apparently my comments about gangrene spreading from western Duluth to eastern Duluth is now part of a Facebook campaign to discredit my candidacy. I’m not suprised. I told a friend who asked me about some of my recent actions it was the only one I regarded as a mistep. Using a baseball analogy I called it an “unforced error.” Its not that I disavow it its more that I didn’t do a good enough job explaining what I meant. The Red Plan has led to a gross under staffing of our classrooms and families fleeing our new schools. Its worst out West where children are being bused from Duluth to Proctor. Test results are dire. I used gangrene to describe what’s happening because its famous for spreading. If the first levy referendum question fails we will be forced to cut another two and a half million dollars from the District’s budget. Is that a knock on West Duluth or is ignoring the calamity a worse knock on Western Duluth? One of the people who brought this all about, Nancy Nilsen, is the person who stands to benefit from this last minute social media campaign. In her comeback attempt she has been aided by Judy Seliga-Punyko who endorsed her with very little commentary in a letter to the Editor recently. She has also been aided by her other confederates on the old School Board Tom Hustad and Ann Wasson who object to my constant reminders of the consequences of the dictatorially imposed Red Plan. They made much of the gangrene comment too in their recent letter to the editor. I don’t know how long the social media campaign has been bubbling along. This is my first whiff of it. Its not the first whiff I have had of a character assassination campaign. I put the strange ad in the Reader to fight off the guilt by association campaign some unpleasant person is trying to spread. I’ve always asked, “if you can’t be passionate about your children what can you be passionate about?” I stand by that today. I also stand by my observation that so far western Duluth has been most savaged by the Red Plan’s unintended consequences. I think passionate parents ought to consider that if they wish to make things better for their children. Killing the messenger has never solved anything. Electing someone too blind to see carnage when it lies at their feet is no better. I have a couple posts worth of thoughts about yesterday’s longish DNT story on the Hermantown building levy. I’m not inclined to start typing now but the posts would cover. A. The justification. I think its justified. B. Its contamination by Johnson Controls. This was a stupid and foreseeable impediment to its passing. C. The cottage industry spawned by Tea Party government haters to derail school levie across the nation. Its this last issue I’ll probably write about. A and B don’t really need much elaboration. I went to some song and dance meeting at 8AM this morning to talk about healthy schools. I probably scared the bejesus out of attendees (who were outnumbered by candidates for public office) because candidates for public office aren’t supposed to speak as though they were John the Baptist. That only gets your head served up on a platter. That will come later as I have lawnsigns to put up if the rain holds off a little longer. But that does leave me with one anecdote. Long time followers will know that I once beat up the current City Council candidate Howie Hanson on the blog over the Red Plan. I won’t link to the post but industrius readers can always plug the name into the search engine to see what I wrote. In substance I criticized the School District for giving Howie a nice payment for advertising school activities on the Internet. I claimed at the time it was Superintendent Dixon’s way of bribing potential critics into zipping their lip about the Red Plan. Howie made a point to tell me that I had been right. He said that he had figured out after the fact that buying off critics is exactly what Dr. Dixon had been doing. He felt bad about that too. Good for Howie. I give credit to anyone who owns up to embarrassing details like this. That bodes well for the City should non-candidate Gary Krause fail to pull off an upset. On Aug. 19 I read the two most intelligent things about the Duluth schools that I’ve seen in the News Tribune in recent years. What follows is an email I’m composing in the blog to be sent to a potential campaign volunteer for the Welty for School board campaign. It may very well decide him against helping me. It will be longish thus TMI (too much information) as for the HRW. That’s me, Harry Robb Welty. If my PCV agrees and continues to volunteer this might become a regular feature of this blog for the duration of my campaign for school board. I’m busy with company, my Father-in-law is in town for the week. I’ll not campaign other than to blog a bit but I don’t want to shirk my hosting responsibilities while he remains with us. I haven’t decided whether I’ll campaign. A few weeks ago I was certain I wouldn’t. I began to have second thoughts about that a week ago or so. When Nancy Nilsen filed I had a reaction not dissimilar to the one I experienced the year I planned to retire from the School Board after eight years service. At the end of that year a noisy controversy broke out about taking the coaching duties away from East High school’s hockey coach. You don’t get much closer to the status of Pope in Northern Minnesota than by coaching a winning hockey team. I filed this morning. Then one of the old board members, Nancy Nilsen, who caught a lot of my most pointed criticism filed after me. Let’s hope its not just a grudge match. There were a truck load of other last minute candidates as well. Let me stipulate first that I know of no school board candidates in previous Duluth elections who had anything other than the best interests of the schools at heart. Certainly that is true of Nancy. I disagreed with her profoundly on pushing the Red Plan through without a vote. It cost her reelection a few years ago. But then again, as I told the reporter for the Trib today, I’ve just lost my last TWO school board races so we can both be accused of being retreads. If this is a bid on Nancy’s part for vindication I think she will be disappointed. If she admits the methods her Board used were highhanded. If she acknowledges that the results of this insensitivity resulted in voter antipathy to the District and large class sizes I will be pleasantly surprised. I’ll wait and see how she explains her wish to be placed on the Board again by the voters. In the meantime I’ve got a long memory and so does this blog. If anyone wonders what I’ve said about Board member Nilsen in the past you’ll find it here in the blog. I also told the Trib reporter I was looking forward to reading the Trib editorial board’s perennial observation about me – that I’m a “perennial” candidate. If they also acknowledged that I have been significantly more accurate in my predictions for the Schools than their editorials (Who can forget the hilarious $32 million windfall prediction?” …….Well, that would be very gratifying. That kind of editorial goof-up about the Duluth schools is another perennial phenomenon. Steve O’Neil was a good guy. Our church had been praying for him in his last days. We egressed the Black Hills early last evening through the Spearfish Canyon Road. It was lovely but the sun was so low that only the very top of the Eastern canyon lay in sunlight. We had tarried too long in Lead, South Dakota after our last in the day tour of the Homestake Mine. I easily took a thousand pictures on my digital camera and have already removed 400 of the lesser ones while cropping and tending to the remaining before a second culling. No one needs 600 pictures of the Black Hills even with your grandchildren in them. I was curious about the absence of my column to the Reader Weekly for the past couple weeks. I called the publisher who told me it would be in the Reader this weekend. That means it should be on their website by tomorrow. I’ll believe it when I see it. He also gave me orders on a one time basis to submit another column by tomorrow for two successive issues. I roughed out something this morning and I’ll putz around with it tonight after watching the Spielberg film Lincoln. Sadly, I had two small boys who disported through most of its first half so that a third viewing will be necessary sans boys. We had planted ourselves in the Black Hills for seven evenings. The first two nights were in Rapid City on its eastern flank. Four nights were spent in Custer, named after the one and only followed by the last night in Spearfish. We visited Rushmore twice, the second time to make up for being chased out by rain on the earliest visit. We traveled most of the best known highways with Claudia at the wheel. She insisted because she is terrified by my gawking at every precipitous hairpin turn instead of keeping my eye on the wheel. We spent an hour and a half on a tour of Jewel Cave a similar time in Hot Springs at the site of a huge mammoth burial site. We petted donkeys and stood amid prairie dogs in custer State Park while seeing the Buffalo we had promised the boys. I had to be glaciered a couple of times by claudia when I passed on too much historical information to our 3 and 5-year-old companions. “Glacier” had been the watchword twenty years ago with my children when I yammered on about something they were tired of hearing about. Tomorrow we drive to Fargo. We’ve promised the littlest traveler a half year birthday at Chuck E Cheese when we get there. Hopefully I’ll be sufficiently primed to finish my second column for next week’s Reader Weekly. Every one is trying to sleep but I’ve got this bright computer on while choral music plays in my headphones. The Hotel’s water was shut off by the City an hour ago so we are all crossing our legs and brushing our teeth with bottled water. Such hardship. …we will keep voting for Republicans who will do nothing to stop him. That’s my shorthand take of the unsurprising poll of Americans by Newsweek that says 40 percent of us think the world will soon come to an end. And many of these people would vote against any do-gooder environmentalist to tried to stop the oceans from rising to cover the billions of us who live on the coast. These Christians are a menace to the world. Their God is a menace to the world. Their savior is the lone horseman of the apocalypse. According to a Newsweek poll, 40 percent of people in the United States believe the world will end with a battle between Jesus Christ and the Antichrist. And overwhelmingly, those people also believe that natural disasters and violence are signs of the approach of the glorious battle, so much so that 22 percent of Americans believe the world will end in their lifetime. This would logically mean that concern for the world of their great-great-grandchildren makes no sense at all and should be dismissed from their minds. In fact, a recent study found that belief in the “second coming” reduces support for strong governmental action on climate change by 20 percent. Apart from the corruption of money, whenever you have 40 percent of Americans believing something stupid, combined with the forces of gerrymandering in the House, disproportionate representation of small states in the Senate, the Senate filibuster, the winner-take-all two-party system that shuts many voices out of the media, out of debates, and off of ballots, and a communications system that mainstreams Republican beliefs, it’s almost guaranteed that the 40-percent view will control the government. over a decade old and was done just before the year 2000 when all sorts of minneniallists thought the Y2K virus or a rapture was imminent. Still, the GOP’s leaders don’t have the ca-hones to call their rapture prone to account for their fatalism and fanaticism. Not if it would cost them votes. Perhaps that will change as young evangelical voters fall away from their blisteringly self righteous, anti-intellectual, and anti-gay churches. A couple weeks ago the Duluth paper published an update on appeals to the state from the Duluth Teachers pension planners to bail them out since they had run short of the funds necessary to pay for the pensions of retired teachers. In part this shortfall came from not reducing payments soon enough as the economy tanked a mistake that fell only on the shoulders of the pension board of directors. The story said that the state had decided to plug the hole to the tune of six million dollars. That almost got my hackles up but I couldn’t tell if the payment was a one time payment or not. I didn’t mind a one year cash infusion but I wondered if the state was planning to expend this money for many years into the future. I was too busy to call and ask what the situation was but I had planned to post my question on the blog. Now I know the answer. It came in the DNT when it republished the St. Paul Pioneer Press’s editorial on the subject. The answer is yes. For each of the next 25 years or so the state has agreed to plug DFRTA’s hole to the tune of $6.3 million annually. That means that our retired teachers could get a $157 million windfall to cover the poor decisions of their pension plan. Other pension plans will be getting similar bail outs and we will just have to wait to see what happens to the mother of all public pensions in Minnesota, PERA, with a projected $16 billion shortfall. “…the remedies should come with a loud note of caution for the public: Public-employee pension funds are under the influence of politicians who, as they apply the remedies, have the power to do favors and solve problems with somebody else’s money: ours. I’ve commented before about pension plans most recently on the red ink in Illinois. One of the faults with democratic elections is the emphasis they put on today at the expense of tomorrow. In the last two decades of the war declared on moderate “RINO” republicans the consequence is that sane fiscal voices like Congressman Jim Leach of Iowa and many others have been killed off in GOP primaries by simple minded, short term strategists who have opted to push “pure” ideologically driven and dreadfully impractical candidates. The vacuum this has left in the vital center of American politics has fallen to Democrats like President Obama. Its still a huge vacuum. Its hard to give any credit to the current GOP minority in the legislature because there aren’t many centrists left. Their current leaders describe the remnants of the Republican side of the legislative aisle as the “grownups.” I wish. Decisions like this one to bail out overly ambitious and unsustainable pensions give all such pension boards an incentive to game the system knowing that poor and incautious investing could be bailed out by taxpayers. Its simply not fair and its not sustainable.